I have repaired Photo Cameras and such, for over 30 years. Was doing some other stuff in between, but Camera repair was always my primary interest. Can't help it, I like to take apart mechanical gadgets. I am retired from Camera repair as BUSINESS. However, at spare time, I still do some selected repairs, custom jobs and Polaroid conversion, but it is more like a Hobby now. 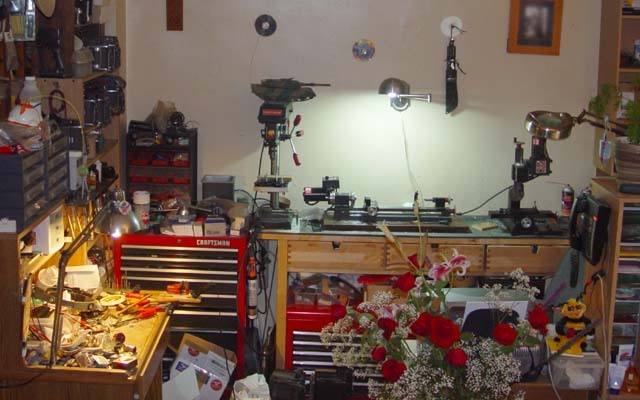 I set up small shop at home, were I do all the work. So, if need some work done on your equipment, let me know. I fix only mechanical cameras, Don't do "point and shoot", and auto-focus cameras. It is no matter when and by whom camera was built, If you want it to work, it most likely will. Just a matter of time. If camera is very old and parts are not readily available, it is going to take some time to find or make one. , don't get me wrong. There is some things out there, that I probably will not be able to fix, but what you got to loose. Did built three stereo cameras. Two of them - 35mm full frame, the third one was medium format for super wide angle custom lenses. In a scarce spare time, I am working on medium format, 6 x 7 frame, folding stereo camera. it's based on Famous Polaroid 110B and Rodenstock-Ysarex lenses. Don't even care if it will sell. It's a challenge. Well..., it is going to take some time. IF YOU HAVE SOME IDEA, EVEN IF IT LOOKS IMPOSSIBLE OR EVEN CRAZY AT FIRST, GET IN TOUCH WITH ME. MAYBE IT IS NOT SO CRAZY AND IT IS POSSIBLE. EASTCAMTECH offers up to twelve months limited warranty. This warranty covers most parts, and labor performed on your equipment. Warranties are voided by damage due to misuse, impact, spilled liquids, sand and negligence. Warranty repairs are limited to the specific problem and/or parts replaced in original repair. I am getting a lot of junk mail. PLEASE! When you sending Email to me, clearly state the subject in subject line. Otherwise it most likely will end up in the TRASH. FYI - Please don't be disappointed, if you did not get respond right away. I don't check my Email everyday, and sometimes before answer it I have to do some research. It may take some time, but ALL Emails will be answered eventually.